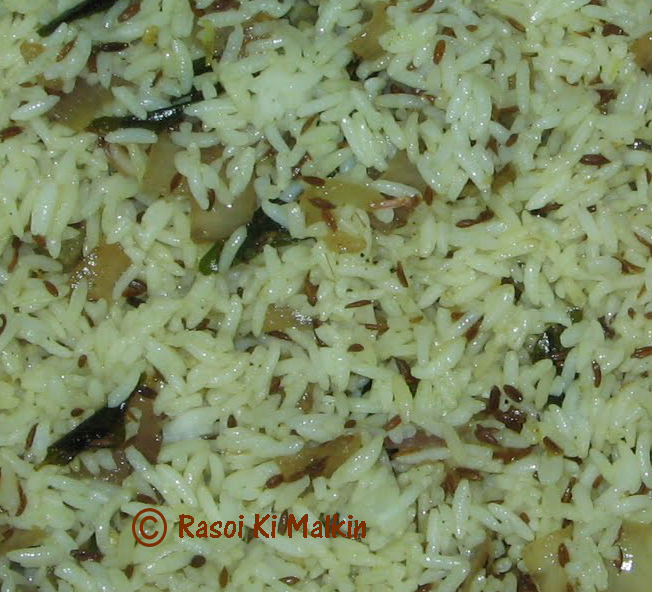 Jeera rice is prepared in minutes of time and no need of vegetables.It is even liked by children very much as it is less spicy food which can be enjoyed by kith and kin..I prepared it in microwave in just a matter of half an hour. Place a micro safe bowl and add oil,then micro high in 900W for 1 minute. 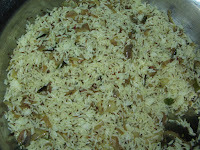 Next add masala items,jeera,tej pathha,and micro high at 900 W for 3 minutes. 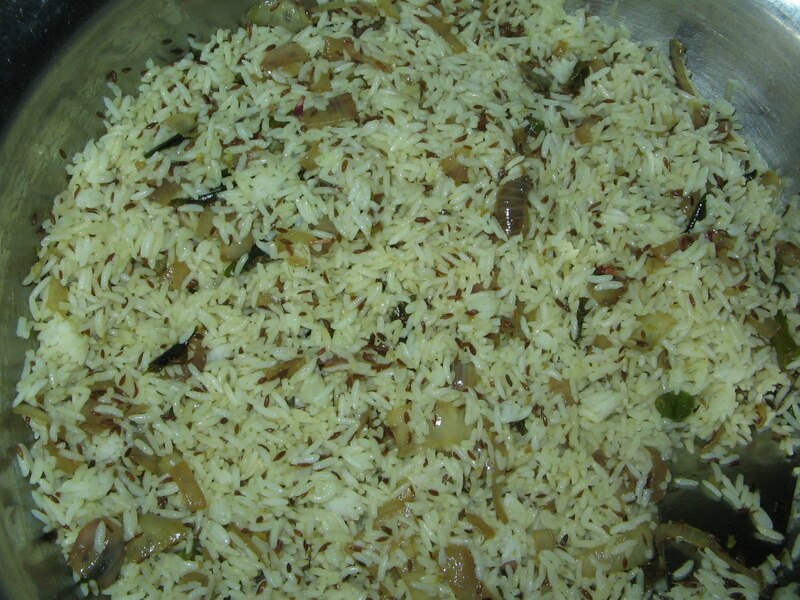 Now add water and rice ,mix well and cook in micro high at 900 W for 10 minutes.Stir once in between,if u are doubtful whether it will get burnt. Lastly remove outside,and add salt,pepper powder,curry leaves and cilantro leaves,and again micro high at 900 W for another 7 to 8 minutes. Remove and transfer into a serving bowl..
Place a pan on the stove add 3 to 4 tablespoons of oil and heat. After heating add jeera and fry for a while,then after wards add chopped onion,greenchilli slits,curry leaves and gingergarlic paste and saute.Then after the onion turned in to transparent,it takes more than 10 mins in low flame,add black pepper powder,and salt.After 2 mins add the cooked rice and mix well for a few seconds.Then switch off the stove.Serve hot. We can also add aloo, carrot and green peas to the dish, and then fry till it is done.I collected this recipe from a book related to cooking. very nice..I will go for stove version!but the recipe is excellent!